The following discussion comes from the anonymous article "In the Beginning" that ran in two parts in volume 67 of the Argosy in 1899. 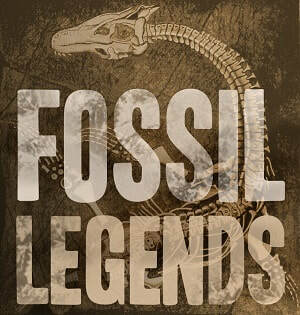 The piece attempted to summarize what was known of geology, weighing "Darwinian" and traditional (creationist) accounts of the various periods of geologic time. 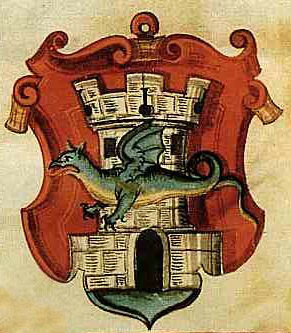 The arms of Klagenfurt as drawn in 1669. … The famous bird, the roc, which has played so important a part in Oriental tradition, originated in the discovery of the cranium and horns of a fossil rhinoceros. The famous dragons of western tradition had also a similar origin. In the city of Klagenfurth, in Carinthia, is a fountain on which is sculptured the head of a monstrous dragon with six feet, and a head surmounted by a stout horn. According to the popular tradition, still prevalent at Klagenfurth, this dragon lived in a cave, whence it issued from time to time, to frighten and ravage the country. A bold cavalier kills the dragon, paying with his life for this proof of his courage. The head of the pretended dragon, killed by the valorous knight, is preserved in the Hotel de Ville, and this head has furnished the sculptor for his fountain with a model for the head of his statue. Herr Unga, of Vienna, recognised at a glance the cranium of the fossil rhinoceros; its discovery in some cave had probably originated the fable of the knight and the dragon. The remains of the Mammoth are met with in all portions of the world, from the equator to the frigid zone. The mammoth was from sixteen to eighteen feet in height. Its monstrous tusks were from ten to fifteen feet in length, and were much curved, with a spiral turn outward. Its body was thickly covered with long, shaggy hair, with a heavy mane upon its neck and back. Fossil ivory was found in Greece at a very early period. Some of the bones of the elephant bear a strong resemblance to those of man, and have often been mistaken for human bones. Thus the Greeks took the patella of a fossil elephant for the knee-bone of Ajax. Time and time again the world has been startled by the announcement of the finding of the remains of giants; but these remains have always, when examined by scientific men, proved to be those of the mammoth. In 1663, the naturalist Leibnitz composed out of some remains which were brought to him a strange animal carrying a horn in the middle of its forehead, which he called the fossil unicorn. Investigation, however, proved that these remains belonged to the mammoth, and the horn was one of the creature's tusks thus fantastically located. But the place where these remains are found most plentifully is on the northern coast of Siberia, though all through Russia they are more or less numerous. We are told by a traveller that an entire island in this locality, which is about a hundred miles in length, "except three or four small rocky mountains, is a mixture of ice and sand; and, as the shores fall, from the heat of the sun thawing them, the tusks and bones of the mammoth are found in great abundance. To use Chooinoff's own expression, the island is formed of the bones of this extraordinary animal, mixed with the horns and heads of the buffalo, or something like it, and some horns of the rhinoceros." New Siberia and the Lachen Islands, off the mouth of the river Lena, are, for the most part, an agglomeration of sand, ice, and the teeth and tusks of mammoths. The commerce in fossil ivory from these sources is an extensive and profitable one. Tusks are here found weighing from one hundred and fifty to two hundred pounds. There is a tradition that these huge creatures lived and burrowed underground. This tradition is held in Russia and Siberia, and the same legend exists among the Chinese. This can hardly be accounted possible, however.